Stylish and decent red and blue designer patola saree. The saree comes with blouse. 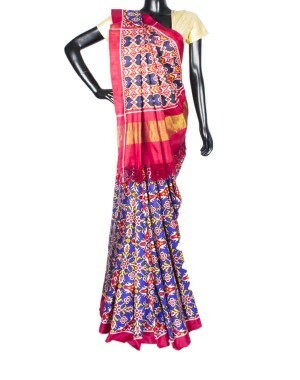 Patola Saree hails from the Gujarat. These hand-woven sarees that are usually worn by royalties earlier are very famous for their ikat print. The saree is specially designed by weavers who have been making these sarees as a family tradition. With so much history behind, owning a patola saree is truly something to be proud about.